KATHMANDU, Feb 7: In a landmark judgment, the Supreme Court on Wednesday directed the Ncell and Axiata companies to pay capital gains tax amounting to over Rs 61 billion to the government. A five-member larger full bench of Chief Justice Cholendra SJB Rana and Justices Meera Khadka, Bishwambhar Shrestha, Ananda Mohan Bhattarai and Tanka Moktan has issued a mandamus order to the defendants—Ncell and Axiata—to pay the huge tax they avoided paying when Ncell shares changed hands three years ago. Issuing the mandamus order in response to a writ petition filed by civil society members including Dwarika Nath Dhungel, the bench directed the two private sector telecommunications service provider companies to cough up the tax . With this decision, the apex court has set a precedent that any firm buying into another company may have to pay such tax if the seller hadn't cleared its tax liabilities on the bought portion. Malaysian company Axiata had bought Reynolds Holdings, which held a majority share in Ncell, from TeliaSonera for $1.03 billion. Reynolds Holdings had appreciated to over Rs 105 billion in April 2015. It was a wholly-owned subsidiary of TeliaSonera and believed to be registered in the tax haven of Saint Kitts and Nevis. The civil society members claimed in their writ petition that taxes had been evaded while transferring the management from TeliaSonera to Axiata . 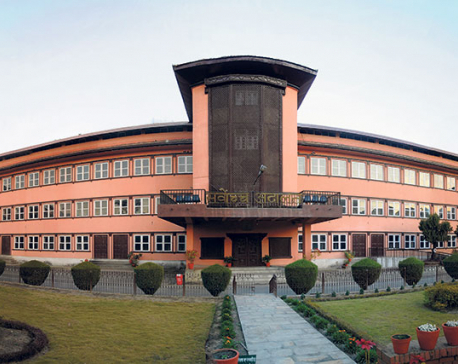 The apex court, meanwhile, annulled writ petitions filed on behalf of Ncell and Rhynolds Holdings, claiming that they did not have any further liability to pay capital gains tax . The apex court issued the mandamus order immediately after concluding weeks of hearings. The bench, however, has not yet issued the text of its ruling. Most of the legal practitioners appearing for the hearings had claimed that it was the obligation of TeliaSonera to pay the capital gains tax. It had sold its shares to Axiata and these had now been transferred to Ncell. However, senior advocate Surendra Bhandari, who attended the hearings on behalf of the public interest litigation filed by civil society members, had claimed that TeliaSonera had already wound up its operations here and therefore the apex court order would not help to recover the capital gains tax. They argued for ordering Ncell to pay the tax. Ncell has already deposited Rs 23.57 billion in two installments as applicable tax on the profit generated through the sale of the telecom company. It paid Rs 9.97 billion in May, 2016 on the basis of its own calculations. It again paid Rs 13.60 billion on June 4, 2017, bowing to intense pressure and criticism from a cross-section of society. TeliaSonera, a Swedish-Finnish company, has not paid any capital gains tax on the sale of its 80 percent share in Ncell to Malaysian company Axiata in April 2015. The Large Taxpayers Office determined that Ncell needed to pay Rs 60.71 billion in capital gains tax and fines and interest calculated as of June 17, 2017. A capital gains tax of Rs 35.91 billion was determined and fines and interest made for the total figure of Rs 60.71 billion. "As of June 17, 2017, the due tax amount was Rs 60.71 billion. 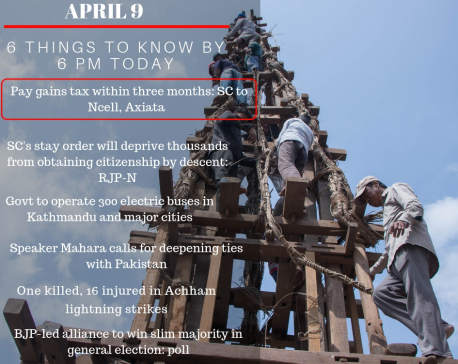 We have yet to add the fine and interest amount since June, 2017," said Dhaniram Sharma, head of the Large Taxpayer Office.The office had written to Nepal Rastra Bank (NRB) to freeze TeliaSonera's bank accounts. 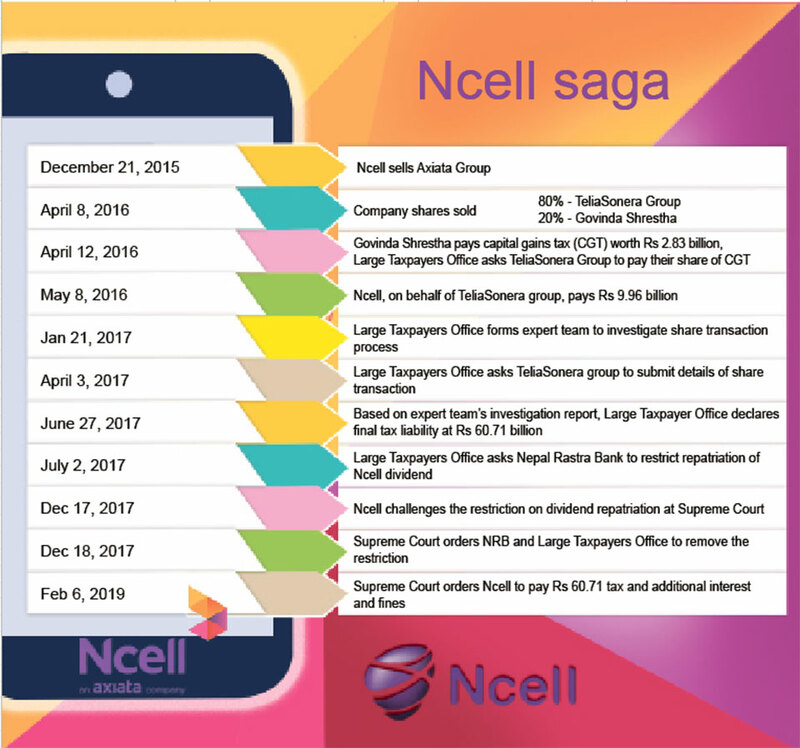 But an apex court division bench of Justices Om Prakash Mishra and Kedar Prasad Chalise on December 18, 2017 allowed TeliaSonera to take money out of the country, staying the hand of the Large Taxpayer Office. The division bench was upholding a short term stay issued by the single bench of Justice Dambar Bahadur Shahi a day following a lawsuit filed on December 27, 2017 citing irreparable loss to the Scandinavian company due to the decision of the government . Senior advocate KC, arguing before the bench, claimed that the business deal evaded billions in taxes while transferring the shares of the telecom provider but sufficient documentation was not brought before the court while filing the writ petition.When asked by the bench to produce the sale contract, advocate Devendara Pradhan, arguing for Reynolds Holdings, claimed that they don't posses such documents because the company was not its sole owner .The Income Tax Act 2001 requires foreign investors to pay 25 percent in capital gains tax. Of this amount, 15 percent is payable by the company that was sold while the remaining 10 percent should be paid by the selling entity. Ncell has to pay 15 percent of the capital gains tax while the remaining 10 percent should be paid by TeliaSonera. Though capital gains tax needs to be paid by the company gaining from the transaction, TeliaSonera has already exited Nepal. Reynolds Holdings, moving the apex court on December 27, 2017, stated that the tax determination order under which the Large Taxpayer Office and Nepal Rastra Bank prevented it from taking its capital gain out of the country was unjust and illegal. It also sought apex court intervention against the order on grounds of balance of convenience and irreparable loss to the company . The government of the day headed by Pushpa Kamal Dahal had also allowed Ncell to operate 4G services, shifting liability for paying the capital gains tax to the already departed TeleaSonera. Challenging the decisions of the cabinet, civil society members including Dhungel had filed another writ petition seeking apex court intervention to recover the evaded capital gains tax.